Excessive proliferation of pulmonary arterial smooth muscle cells (PA-SMCs) and perivascular inflammation lead to pulmonary arterial hypertension (PAH) progression, but they are not specifically targeted by the current therapies. Since leptin (Ob) and its main receptor ObR-b contribute to systemic vascular cell proliferation and inflammation, we questioned whether targeting Ob/ObR-b axis would be an effective antiproliferative and anti-inflammatory strategy against PAH. In idiopathic PAH (iPAH), using human lung tissues and primary cell cultures (early passages ≤5), we demonstrate that pulmonary endothelial cells (P-ECs) over produce Ob and that PA-SMCs overexpress ObR-b. Furthermore, we obtain evidence that Ob enhances proliferation of human PA-SMCs in vitro and increases right ventricular systolic pressure in Ob-treated mice in the chronic hypoxia-induced pulmonary hypertension (PH) model. Using human cells, we also show that Ob leads to monocyte activation and increases cell adhesion molecule expression levels in P-ECs. We also find that Ob/ObR-b axis contributes to PH susceptibility by using ObR-deficient rats, which display less severe hypoxia-induced PH (pulmonary haemodynamics, arterial muscularisation, PA-SMC proliferation and perivascular inflammation). Importantly, we demonstrate the efficacy of two curative strategies using a soluble Ob neutraliser and dichloroacetate in hypoxia-induced PH. We demonstrate here that Ob/ObR-b axis may represent anti-proliferative and anti-inflammatory targets in PAH. Pulmonary vascular remodelling in pulmonary arterial hypertension (PAH) is partly explained by excessive proliferation of pulmonary arterial smooth muscle cells (PA-SMCs) and perivascular inflammatory infiltrate, and represents the cause of mean pulmonary arterial pressure (PAP) increase leading to progressive functional decline in PAH patients. In addition, among the inflammatory cells that infiltrate the pulmonary vascular wall, the monocyte/macrophage lineage cells have been recently clearly identified as critical immune cells promoting pulmonary vascular remodelling in PAH [1, 2]. Beside this knowledge, the mechanisms and risk factors that mediate PA-SMC proliferation and monocyte/macrophage activation and accumulation are incompletely understood. Therapeutic approaches for reversing pulmonary vascular remodelling in PAH that directly address mechanisms involved in PA-SMC proliferation and pulmonary perivascular infiltration of cells from monocyte/macrophage lineage have not, so far, been identified and translated into clinical practice. Approved PAH therapies are weak anti-proliferative and anti-inflammatory agents and, despite the current available medical treatment advances, the median survival for patients suffering from idiopathic PAH (iPAH) following diagnosis is 2.8 years, which is still unacceptable . 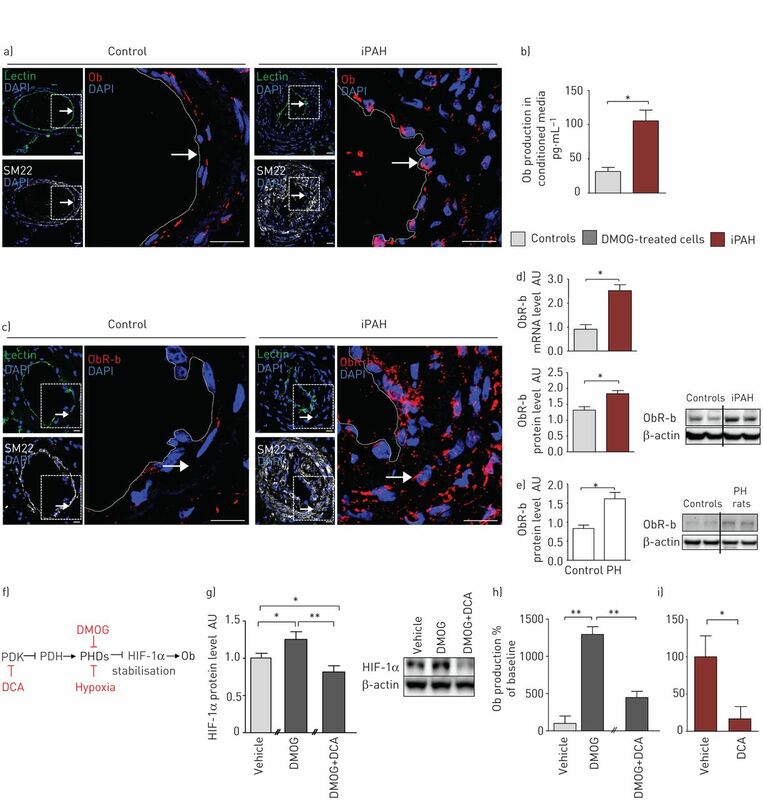 Recent investigations provide clear evidence that leptin (Ob), a hypoxia-inducible factor (HIF)-dependent gene, and its main receptor ObR-b contribute to systemic vascular remodelling, in particular in cardiovascular diseases, acting as a proliferative and migratory factor for systemic vascular SMCs, and as a potent immunomodulator for vascular wall inflammatory cell infiltration [4–7]. Indeed, Ob/ObR-b axis enhances and accelerates atherosclerosis through various mechanisms, including stimulating proliferation of vascular SMCs, intimal monocyte recruitment, macrophage to foam cell transformation, and further secretion of proatherogenic cytokines . Although we know that the circulating Ob level is increased in iPAH patients and may play a role in the disease physiopathology [7, 9–11], the translational relevance of Ob/ObR-b axis in pulmonary vascular proliferation and perivascular monocyte/macrophage lineage cell accumulation is still unclear. Hence, we postulated that Ob/ObR-b axis may contribute to PAH development and/or progression and we questioned whether: 1) Ob and ObR-b are key contributors to the pulmonary vascular remodelling and perivascular monocyte/macrophage lineage cell accumulation associated with human and experimental pulmonary hypertension (PH); and 2) Ob/ObR-b signalling inhibitors would be an effective treatment strategy against PAH. Taken together, our results provide, for the first time, a framework for Ob-based intervention in PAH and identify molecules with possible therapeutic potential for this devastating disease. This study was approved by the local ethics committee (CPP Ile-de-France VII, Paris, France) and all patients signed written informed consent. Animal studies were approved by the administrative panel on animal care from Université Paris-Sud (Paris, France). Blood samples were collected from patients with iPAH during usual follow-up and in control subjects (table 1). Inclusion criteria were age >18 years and PAH diagnosis confirmed by right heart catheterisation with a stable clinical and haemodynamic status for the last 3 months. Exclusion criteria were a heritable form of PAH, diabetes and metabolic syndrome. Characteristics at diagnosis and follow-up were stored in the Registry of the French Network of PH in agreement with French bioethics laws (Commission Nationale de l'Informatique et des Libertés). For in situ and in vitro studies, lung specimens were obtained at the time of lung transplantation from patients with iPAH or obtained from patients without any evidence of pulmonary vascular disease who underwent lobectomy or pneumonectomy for localised lung cancer with the normal tissue collected at a distance from the tumours (Marie Lannelongue Hospital, Le Plessis-Robinson, France) (table 2). Human pulmonary endothelial cells (P-ECs) and PA-SMCs were isolated from distal pulmonary arteries and cultured as previously described [12–14]. Cells (early passages ≤5) were placed in serum-free medium for 24 h and exposed with dimethyloxaloylglycine (DMOG, 0.25 mM) (Enzo Life Sciences, Villeurbanne, France), dichloroacetate (DCA, 5 mM) (Sigma-Aldrich, Lyon, France), and recombinant Ob (10 and 100 ng·mL−1) (R&D Systems, Lille, France) for 24 h. For in vitro Ob treatment, a physiological dose (10 ng·mL−1) and ten times more (100 ng·mL−1) were used, based on the literature [15–17]. Proliferation was assessed by 5-bromo-2-deoxyuridine (BrdU) incorporation . After blood withdrawal, peripheral blood mononuclear cells (PBMCs) from control subjects were freshly isolated by standard Ficoll gradient centrifugation. Cells were then incubated in RPMI media with 1% of fetal calf serum and recombinant Ob (10 or 100 ng·mL−1) for 24 h.
For in vivo studies, rodents were exposed to either normoxia or to 3 weeks of hypoxia (inspiratory oxygen fraction 10%). Male C57BL/6j mice (5-weeks old) (Janvier Labs, St. Berthevin, France) were divided in six groups: two control groups that were untreated and exposed to normoxia or hypoxia; two groups treated with daily intraperitoneal injections of recombinant Ob from day −2 to day 21 (3 μg·g−1 of initial body weight ), exposed to normoxia or hypoxia; two groups treated with daily i.p. injections of soluble recombinant protein ObR (ObR:Fc) (R&D Systems) from day 14 to day 21 (100 μg·mouse−1 ), exposed to normoxia or chronic hypoxia. Sprague-Dawley male rats (4-weeks old) (Charles River Laboratories, Larberesle, France) were divided into four groups: two control groups (vehicle in drinking water) exposed to normoxia or hypoxia; two groups treated with DCA from day 14 to day 21 (1 g·L−1 in drinking water) exposed to normoxia or chronic hypoxia. Two groups of male Zucker diabetic fatty (ZDF) transgenic rats (ZDF/Lepr fa/fa) (Charles River Laboratories) that were 4-weeks old, and 2 groups of age-matched control rats (ZDF/LeprCrl) (Charles River Laboratories) were exposed to either normoxia or chronic hypoxia. We also tested the rat monocrotaline model of PH, which was not specific to study Ob/ObR-b axis (fig. S3). Animals were anesthetised with isoflurane and haemodynamic parameters were measured as previously described in mice (right ventricular systolic pressure (RVSP))  and in rats (mean PAP and pulmonary vascular resistance (PVR)) . Then, blood was removed for PBMC analyses and the thorax was opened and the left lung immediately removed and frozen. The right was fixed in the distended state with formalin buffer. Right ventricular hypertrophy (RVH) Fulton index and the percentage of muscularised vessels were determined as previously described . Total RNA was isolated from frozen lungs using Trizol (Invitrogen, St. Aubin, France) and RNeasy mini kit (Qiagen, Courtaboeuf, France). Total RNA (2 µg) was reverse-transcribed using Superscript II (Invitrogen) per manufacturer's instructions. Gene expression levels of ObR, Ki67, Cyclin D1, intracellular adhesion molecule (ICAM)-1, vascular cell adhesion molecule (VCAM)-1 and E-selectin were quantified using pre-verified Assays-on-Demand TaqMan primer/probe sets (Applied Biosystems, St. Aubin, France) and normalised to 18S ribosomal RNA using the comparative Cycle threshold (Ct) method (2-ΔΔCt) [13, 21, 22]. Cells/tissues were homogenised and sonicated in PBS containing protease and phosphatase inhibitors and 30 µg of protein was used to detect ObR-b (R&D Systems and Santa Cruz Biotechnology (Le Perray-en-Yvelines, France) for humans and rodents, respectively) and β-actin (Sigma-Aldrich) as previously described . Concentrations in Ob in conditioned media from P-ECs were evaluated using Quantikine (R&D Systems) according to the manufacturer instructions. Immunohistochemistry and immunocytofluorescent staining with antibodies against α-smooth muscle cell actin (α-SMA) and proliferating cell nuclear antigen (PCNA) (Dako, Les Ulis, France), Ob, smooth muscle (SM)22, Tie2, CD68, F4/80 and CD206 (Santa Cruz Biotechnology), ObR-b (R&D Systems), or lectin protein (Sigma-Aldrich) were performed as previously described . Images were taken using LSM700 confocal microscope and then Zen software (Zeiss, Marly-le-Roi, France). PBMCs from control and iPAH patients, and from rodents, were fluorescently labelled with the following antibodies fluorophore-conjugated monoclonal anti-CD14, anti-CD25 and anti-CD11b (Becton Dickinson, Rungis, France), anti-CD4 (MiltenyiBiotec, Paris, France), and anti-ObR-b (R&D Systems), as previously described . Flow cytometry gating was set as previously described . Flow cytometry data were acquired with a flow cytometer (MACSQuant Miltenyi Biotec) and analysed by FlowJo software program (Tree Star, Inc. Ashland, OR, USA). Results are expressed as means±sem. A p<0.05 level of statistical significance was used for all analyses. Statistical significance was tested using the nonparametric Mann–Whitney test or two-way ANOVA with Bonferroni post hoc tests. All statistical procedures were carried out using GraphPad Prism version 5.0 (GraphPad Software Inc. San Diego, CA, USA). To determine whether the Ob/ObR-b axis is locally upregulated in the pulmonary vasculature of iPAH patients, we co-immunostained human lung tissues from 10 iPAH patients and 10 controls with either antibodies against Ob or ObR-b, together with a α-SMC-specific surface marker SM22 and a lectin staining of vascular endothelium. On the one hand, our confocal microscopic analyses revealed a strong Ob staining within the endothelium of distal pulmonary arteries from iPAH patients as compared to control specimens (fig. 1a). Interestingly, these in situ observations were replicated in vitro in human freshly isolated P-ECs. Primary early passage (≤5) cultures of P-ECs from iPAH (n=5 patients) exhibited a marked increase in Ob production compared to control cells (n=5 subjects) as measured by ELISA immunoassay, with a four times increase in Ob content in P-EC conditioned media (fig. 1b). Of note, we were also able to exclude PA-SMCs as another local source of Ob in iPAH by in situ and in vitro analyses (fig. S1A). Upregulation of leptin (Ob)/Ob main receptor (ObR-b) axis in human idiopathic pulmonary arterial hypertension (iPAH). a and b) Human pulmonary endothelial cells (P-ECs) as Ob in PAH. a) Representative images of in situ Ob staining (red) from controls and patients with iPAH, in which P-ECs are positive for lectin (green) and pulmonary arterial smooth muscle cells (PA-SMCs) are positive for SM22 (white). b) In vitro quantification of Ob production in conditioned media of primary early (≤5) passage cultures of human P-ECs from controls (n=15) and iPAH patients (n=10). c–e) Human and rodent PA-SMCs overexpress the ObR-b in PAH. c) Representative image of ObR-b (red) staining in PA-SMCs, positive for SM22 (white), in lungs from controls and iPAH patients, in which P-ECs are positive for lectin (green). d) Quantification of ObR-b mRNA level in primary early (≤5) passage cultures of human PA-SMCs from controls (n=10) and iPAH (n=10), and quantification for ObR-b/β-actin ratio in primary early (≤5) passage cultures of human PA-SMCs from controls (n=5) and iPAH (n=5) with representative Western blots. e) Quantification of ObR-b/β-actin ratio in rat lungs, from controls (n=5) and chronic hypoxia-induced pulmonary hypertension (PH) (n=5), with representative Western blot. f–i) Dichloroacetate (DCA) abolishes the excessive endothelial-derived Ob production. f) Schematic representation of the role of dimethyloxaloylglycine (DMOG) and DCA in Ob signalling pathway. PDK: pyruvate dehydrogenase kinase; PDH: pyruvate dehydrogenase; PHD: prolyl hydroxylase domains; HIF: hypoxia-inducible factor. g) Quantification of HIF-1α/β-actin ratio and a representative Western blot in primary early (≤5) passage cultures of human P-ECs from controls in untreated (vehicle, n=3), DMOG-treated (n=3) or DMOG+DCA-treated (n=3) conditions. h and i) Quantification of Ob production in conditioned media of primary early (≤5) passage cultures of human P-ECs from h) controls in untreated (n=3), DMOG-treated (n=3) or DMOG+DCA-treated (n=3) conditions and from i) human P-ECs from iPAH patients in untreated (n=3) or DCA-treated conditions (n=3). DAPI: 4',6-diamidino-2-phenylindole; AU: arbitrary unit. *: p<0.05; **: p<0.01. Scale bar=20 µm. On the other hand, by confocal microscopic analyses and double labelling with ObR-b and SM22, we found a strong in situ ObR-b staining within the PA-SMCs from iPAH patients, as compared with a weak staining within control PA-SMCs (fig. 1c). We also confirmed our in situ observations by in vitro studies with primary early passage (≤5) cultures of PA-SMCs from iPAH and controls; we found an increased ObR-b expression in PA-SMCs from iPAH patients compared to control PA-SMCs, at the mRNA and protein level (fig. 1d). These findings were also replicated in vivo, where rats which developed PH displayed an increased ObR-b protein level in lungs compared to controls (fig. 1e). Of note, we found that ObR-b was weakly expressed in P-ECs, with no difference in ObR-b expression between P-ECs from iPAH patients and controls (fig. S1B). Since our in situ and in vitro data indicate that P-ECs represent an abnormal pulmonary source of Ob in iPAH, we performed subsequent in vitro studies to test whether Ob could be induced by hypoxic conditions. Indeed, hypoxia is a strong inducer of Ob expression due to the presence of hypoxia response elements in the Ob gene promoter that can recruit HIF-1α [23, 24]. Therefore, we first treated human fresh early passages (≤5) cultures of isolated P-ECs from control subjects with DMOG, a cell permeable prolyl-4-hydroxylase inhibitor that upregulates hypoxia-induced stabilisation of HIF-1α in vitro by inhibiting prolyl hydroxylase-dependent HIF-1α degradation (fig. 1f) . DMOG-treated P-ECs produced very high levels of Ob compared to untreated cells, confirming that Ob could be induced by HIF-1α in P-ECs (fig. 1g). Since emerging evidence indicate that activation of mitochondrial signalling can affect HIF-1α stabilisation, we tested the efficacy of a pyruvate dehydrogenase kinase inhibitor DCA [26, 27] (fig. 1f) to normalise the endothelial-derived Ob production using primary human P-ECs derived from control lung specimens. We tested HIF-1α protein expression in vitro, subjecting control P-ECs to DMOG and DCA. We found that HIF-1α was increased in DMOG-treated cells and normalised when DCA was added (fig. 1g). Consistently, we found that the DMOG-induced increase in Ob content in P-EC conditioned media was totally inhibited by DCA in vitro (fig. 1h). Furthermore, we found that DCA treatment abolished Ob content in conditioned media of iPAH P-ECs (fig. 1i). These results are in accordance with previous data showing that there is an abnormal endothelial activation of HIF-1α in iPAH lungs, when compared to control cells, in both normoxic and hypoxic conditions . Moreover, it has been shown that HIF-1α-deficient mice and HIF-2α-deficient mice are both protected from chronic hypoxic PH, indicating that HIF-1α and HIF-2α may play key pathogenic roles in PH [29–31]. Altogether, our data highlight that, in iPAH, Ob is abnormally produced by dysfunctional P-ECs, which could be partly explained by HIF-1α sustained stabilisation. This phenomenon is even more important given the fact that its receptor ObR-b is overexpressed by PA-SMCs in iPAH. 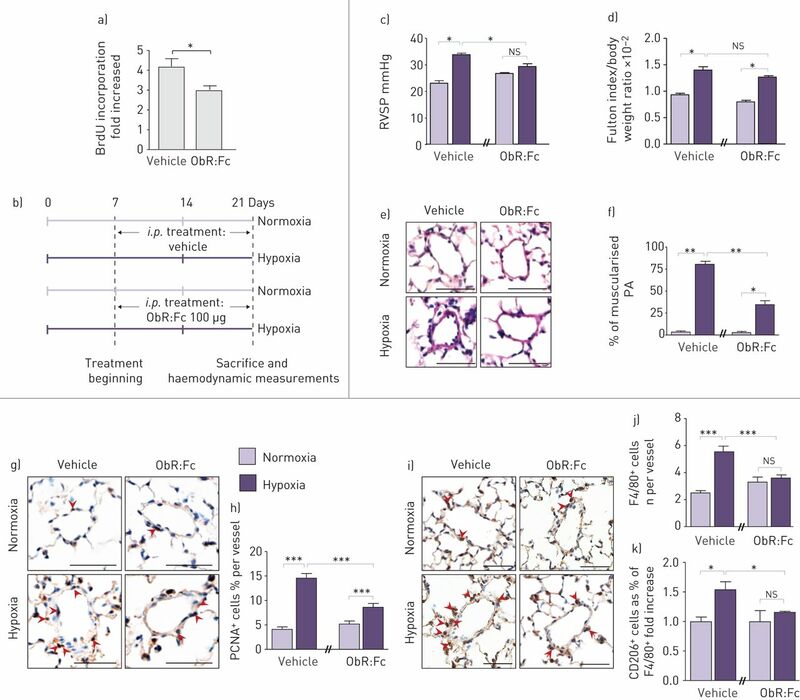 Transgenic mice lacking Ob (ob/ob) or its receptor ObR (db/db) are known to be protected from neointima formation in response to vascular injury, whereas exogenous administration of Ob promotes experimental lesion formation in a receptor-specific manner [6, 8, 32, 33]. Based on this knowledge, we tested whether Ob/ObR-b axis could play similar roles in pulmonary vascular remodelling in iPAH. We first investigated the proliferative capacity of Ob with in vitro studies using primary human PA-SMCs isolated from lung tissues obtained from iPAH patients and controls. By BrdU incorporation, we demonstrated that PA-SMCs from iPAH patients proliferate more in response to exogenous Ob as compared to control PA-SMCs (fig. 2a). In order to further investigate the role of Ob/ObR-b axis in PA-SMC proliferation, we subjected mice to daily injections with recombinant Ob, during chronic hypoxia exposure-induced PH. Interestingly, the hypoxia-induced overexpression of Ki67 (fig. 2b) and Cyclin D1 (fig. 2c) was even greater in Ob-treated mice, as measured by qRT-PCR. Our in vitro and in vivo data demonstrate that Ob/ObR-b axis induces PA-SMC proliferation, thereby promoting the excessive PA-SMC proliferation in PAH. Recent evidence now points to chronic activation of the monocyte/macrophage lineage as critical immune cells as a root cause for promoting pulmonary vascular remodelling in PAH . On the other hand, it is known that Ob influences macrophage behaviour . Thus, we sought to investigate the contribution of the Ob/ObR-b axis to this pathogenic phenomenon. We first assessed the monocyte/macrophage lineage activation in iPAH, using freshly withdrawn PBMCs from iPAH patients and control subjects. We triple labelled PBMCs with monocyte phenotype and activation markers, CD14 and CD11b/CD25, respectively, and analysed them by flow cytometry. We found an overexpression of the activation markers CD11b and CD25 in iPAH patients compared to controls, whereas the two groups of subjects displayed the same number of CD14+ monocytes (fig. 2d–g). Importantly, we found that activated monocytes overexpressed ObR-b in iPAH patients compared to control subjects (fig. 2 h), suggesting a role for the Ob/ObR-b axis in the monocyte activation in iPAH. To further validate this hypothesis, we exposed freshly withdrawn control PBMCs to exogenous Ob in vitro. We found that, after 24 h in vitro, Ob-treated monocytes were more activated compared to untreated cells, in a dose-dependent manner (fig. 2i–k). We performed subsequent studies to further investigate the role of the over activation of Ob/ObR-b axis in the perivascular inflammatory cell recruitment observed in experimental and human PAH. We subjected primary human P-ECs isolated from lung tissues obtained from iPAH patients and controls to exogenous recombinant Ob for 24 h. Interestingly, Ob-treated P-ECs displayed increased expressions of ICAM-1, VCAM-1 and E-selectin, at the mRNA level, when compared with untreated cells (fig. 2l–n). To validate the relevance of these in vitro observations, we set up a murine model of chronic activation of Ob/ObR-b axis by daily Ob administration during 3 weeks of hypoxia exposure (fig. 3a). Interestingly, we validated a decrease in body weight in Ob-treated mice as compared to untreated animals in normoxic conditions, which was further decreased after hypoxia (fig. 3b). By using this murine model, we were also able to demonstrate that chronic Ob administration worsens PH severity in chronic hypoxic mice. Indeed, Ob-treated mice displayed higher pulmonary haemodynamic parameters, as reflected by increased RVSP measured by right heart catheterisation (fig. 3c), as compared to untreated mice after 3 weeks of hypoxia. However, no change was observed in RVH, in small muscularisation of pulmonary arteries (fig. 3d–f) and in wall thickness (fig. S2A). Interestingly, chronic Ob injections enhance PA-SMC proliferation (fig. 3g and h) and perivascular macrophage infiltration (figs 3i and j, and S4) in normoxic conditions. 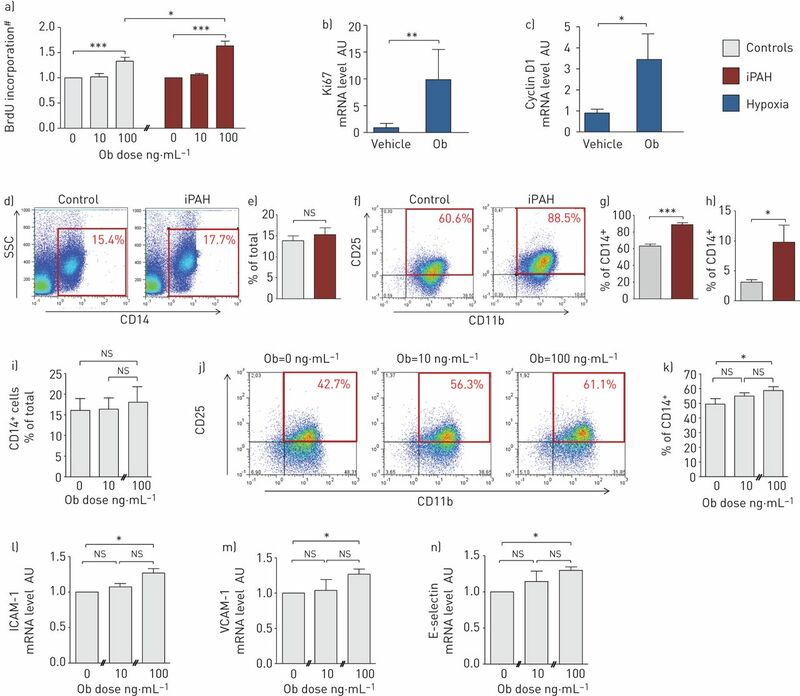 Importantly, Ob injections enhance the hypoxia-induced monocyte/macrophage activation as compared to untreated mice (fig. 3k), measured by the surface marker CD206 expression. Daily leptin (Ob) injections act on chronic hypoxia-induced pulmonary hypertension (PH). a and b) Murine model of chronic activation of Ob/Ob main receptor (Obr-b) axis. a) Experimental strategy of chronic recombinant Ob intraperitoneal (i.p.) injections in mice exposed to normoxia or hypoxia (n=5 in each condition). b) Body weight. c–f) Chronic Ob injections increase right ventricular systolic pressure (RVSP) in hypoxia-induced-PH. c) RVSP. d) Right ventricular hypertrophy measured by Fulton index normalised by body weight. e) Representative images of haematoxylin and eosin staining. Scale bar=50 μm. f) Quantification of the percentage of muscularised pulmonary arteries (PA) in mice. g–k) Chronic Ob injections enhance pulmonary arterial smooth muscle cell proliferation and perivascular macrophage activation. Representative images of g) proliferating cell nuclear antigen (PCNA), scale bar=50 µm and i) F4/80 markers, scale bar=20 µm. h and j) Quantification of cells expressing PCNA and F4/80 markers, respectively, in mice PA. k) Quantification of double-positive cells for CD206 and F4/80 in mice PA. ns: nonsignificant; *: p<0.05; **: p<0.01; ***: p<0.001. Taken altogether, our data demonstrate that the over activation of the Ob/ObR-b axis contributes to pulmonary vascular remodelling in PH, promoting not only the PA-SMC proliferation, but also the perivascular macrophage accumulation. We next investigated whether Ob/ObR-b axis could increase PH susceptibility using ZDF transgenic rats which lack ObR (ZDF/Lepr fa/fa) and exposed them to chronic hypoxia or normoxia (fig. 4a and b). Leptin (Ob)/Ob main receptor (ObR-b) axis enhances chronic hypoxia-induced pulmonary hypertension (PH) susceptibility. a and b) ObR-deficient Zucker Diabetic Fatty (ZDF) transgenic rats. a) Experimental strategy of ZDF transgenic rats exposed to normoxia or hypoxia (n=5 in each condition). b) Body weight. c–g) ObR-deficiency protects against chronic hypoxia-induced-PH development. c) Mean pulmonary arterial pressure (PAP), d) pulmonary vascular resistance (PVR), and e) right ventricular hypertrophy measured by Fulton index normalised by body weight. f) Representative images of haematoxylin and eosin stain (HE) and α-smooth muscle cell actin (α-SMA) and g) quantification of the percentage of muscularised pulmonary arteries (PA) in rat lungs. h–k) ObR-deficiency decreases pulmonary arterial smooth muscle cell proliferation and perivascular macrophage accumulation. h and j) Representative images of proliferating cell nuclear antigen (PCNA) and CD68 staining, respectively, in rat PA. i and k ) Quantification of cells expressing PCNA and CD68 markers, respectively, in rat PA. ns: nonsignificant; *: p<0.05; **: p<0.01. Scale bar=50 µm. Interestingly, after 3 weeks of chronic hypoxia exposure, ZDF rats developed a less severe disease, as compared to their wildtype littermates (ZDF/LeprCrl), as reflected by the decreased values of mean PAP, PVR, RVH, muscularisation of pulmonary arteries and wall thickness (fig. S2B) when compared with control rats (fig. 4c–g). In addition, ZDF rats exhibit lower numbers of PCNA+ cells (fig. 4h and i) and CD68+ cells (fig. 4j and k), as compared to their wildtype controls. Taken together, these findings indicate that Ob/ObR-b axis contributes to chronic hypoxia-induced PH susceptibility. To investigate the efficacy of Ob/ObR-b axis inhibition as a potential therapeutical target for PAH treatment, we performed a preclinical study using two different strategies against PH progression in the hypoxia-induced PH in rodents. Firstly, our experimental strategy was to test the in vitro efficacy of the soluble recombinant ObR protein (ObR:Fc) to neutralise Ob/ObR-b axis using primary human cells. We exposed control PA-SMCs to the conditioned media of iPAH P-ECs, treated or not with ObR:Fc. By measuring BrdU incorporation, we found that PA-SMCs exposed to ObR:Fc-treated P-EC conditioned media proliferated less than PA-SMCs exposed to untreated P-EC conditioned media (fig. 5a). Based on these observations, we then chronically injected ObR:Fc in mice in our chronic hypoxia-induced PH model (fig. 5b). Compared to untreated mice, we interestingly found that chronic injections of ObR:Fc in mice was followed by lower increases in values of RVSP, in the percentage of partially or fully muscularised distal vessels (fig. 5c–f) and in wall thickness (fig. S2C). Consistent with these data, we found that ObR:Fc treatment significantly decreased the number of PCNA+ cells in the chronic hypoxia-induced PH, when compared with vehicle treatment (fig. 5g and h). Furthermore, less perivascular macrophage accumulation was measured by in situ F4/80 staining (figs. 5i and j, and S5), as compared to untreated mice. Importantly, ObR:Fc treatment decreased hypoxia-induced macrophage activation, as measured by CD206 expression (fig. 5k). Targeting leptin (Ob)/Ob main receptor (ObR-b) axis with an Ob neutraliser (ObR:Fc) protects against pulmonary hypertension (PH) progression. a and b) Efficacy of an Ob neutraliser treatment in chronic hypoxia-induced PH. a) Quantification of 5-bromo-2-deoxyuridine (BrdU) incorporation in primary early (≤5) passage cultures of human pulmonary arterial smooth muscle cells (PA-SMCs) from controls exposed to the conditioned media of pulmonary endothelial cells (P-ECs) from idiopathic pulmonary arterial hypertension (iPAH) patients untreated (vehicle) or treated with ObR:Fc (n=3 in each condition). b) Experimental strategy of chronic ObR:Fc intraperitoneal (i.p.) injections in mice exposed to normoxia or hypoxia (n=5 in each condition). c–f) ObR:Fc treatment protects against chronic hypoxia induced PH progression. c) Right ventricular systolic pressure (RVSP), d) right ventricular hypertrophy measured by Fulton index, normalised by body weight, e) representative images of haematoxylin and eosin staining, and f) quantification of the percentage of muscularised pulmonary arteries (PA) in mice. g–k) ObR:Fc treatment increases PA-SMC proliferation and perivascular macrophage activation. Representative images of g) proliferating cell nuclear antigen (PCNA) and i) F4/80 staining. h and j) Quantification of cells expressing PCNA and F4/80 markers, respectively, in mice PA. k) Quantification of double-positive cells for CD206 and F4/80 in mice PA. ns: nonsignificant; *: p<0.05; **: p<0.01; ***: p<0.001. Scale bar=50 µm. Our second therapeutical strategy was to indirectly modulate Ob/ObR-b axis using DCA. We first investigated whether hypoxia could trigger P-EC-derived Ob synthesis in vivo and whether DCA could inhibit this hypoxia-induced effect. Consistently with our in vitro observations (fig. 1g), our in vivo data demonstrate that rats exposed to chronic hypoxia displayed greater Ob content in P-ECs, as compared to normoxic rats and, most importantly, that DCA treatment abolished the endothelial-derived Ob production induced by hypoxia (fig. 6a). Then, we thus tested the efficacy of DCA treatment in vivo (fig. 6b) and found that DCA-treated rats displayed a less severe disease as assessed by lower mean PAP, PVR and RVH (fig. 6c–e) as well as lower percentage of muscularised distal pulmonary arteries (fig. 6f and g) and wall thickness (fig. S2D), compared with untreated rats. Furthermore, DCA treatment also decreased PA-SMC proliferation, measured by PCNA staining (fig. 6h and i), and less perivascular macrophage accumulation, measured by CD68 expression (fig. 6j and k), compared with untreated rats. Chronic dichloroacetate (DCA) treatment modulates leptin (Ob)/Ob main receptor (ObR-b) axis in hypoxia-induced pulmonary hypertension (PH). a and b) Chronic DCA treatment abolishes endothelial-derived Ob production in hypoxia. a) Representative images of in situ Ob staining (red) in rat lungs exposed to normoxia or hypoxia, treated with or not treated with DCA at a concentration of 1 g·L-1, in which pulmonary endothelial cells (P-ECs) are positive for Tie2 (green). b) Experimental strategy of chronic DCA treatment in drinking water in rats exposed to normoxia or hypoxia (n=5 in each condition). c–g) DCA treatment protects against chronic hypoxia-induced PH progression. c) Mean pulmonary arterial pressure (PAP), d) pulmonary vascular resistance (PVR), and e) right ventricular hypertrophy measured by Fulton index normalised by body weight. f) Representative images of haematoxylin and eosin staining (HE) and α-smooth muscle cell actin (α-SMA). g) Quantification of the percentage of muscularised pulmonary arteries (PA) in rat lungs. 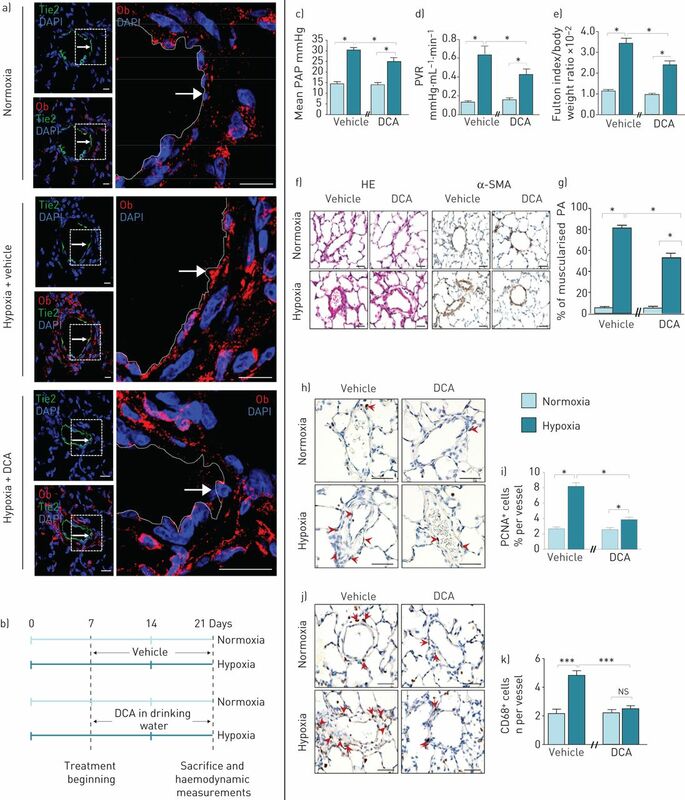 h–k) DCA treatment decreases pulmonary arterial smooth muscle cell proliferation and perivascular macrophage accumulation. Representative images of stained h) proliferating cell nuclear antigen (PCNA) and j) CD68+. i and k) Quantification of cells expressing PCNA and CD68 markers, respectively, in rat PA. DAPI: 4',6-diamidino-2-phenylindole; ns: nonsignificant; *: p<0.05; ***: p<0.001. Scale bar=50 µm. Taken altogether, our data clearly demonstrate the efficacy of two curative strategies targeting Ob/ObR-b axis in chronic hypoxia-induced PH, using an Ob neutraliser ObR:Fc and DCA. We are demonstrating here, for the first time, abnormal over activation of Ob/ObR-b axis in the pulmonary vascular wall and its contribution to the susceptibility and progression of chronic-hypoxia induced PH. By combining in situ, in vitro and in vivo experiments, we are showing that in iPAH, compared to controls: 1) human and rodent P-ECs over produce Ob, which could be partly explained by HIF-sustained stabilisation; 2) human and rodent PA-SMCs overexpress ObR-b and proliferate excessively in response to exogenous Ob; and 3) Ob/ObR-b axis drives perivascular monocyte/macrophage lineage cell accumulation by: activating circulating monocytes, contributing to perivascular macrophage increase, inducing ICAM-1, VCAM-1, and E-selectin overexpression in P-ECs. Consistent with our findings in humans, we demonstrate that chronic injections of recombinant Ob can worsen PH severity in the murine model of chronic hypoxia-induced PH. We also demonstrate that Ob/ObR-b axis increases PH susceptibility, using ObR-deficient rats which displayed less severe disease after chronic hypoxia exposure, as assessed by pulmonary haemodynamics, cardiac output, RVH, pulmonary arterial muscularisation, SMC proliferation and perivascular monocyte/macrophage lineage cell accumulation. Importantly, we also demonstrate the efficacy of two curative strategies targeting Ob/ObR-b axis in PH: a soluble Ob neutraliser and DCA. Our study demonstrates the role of Ob/ObR-b axis in PH pathogenesis. Structural remodelling of the pulmonary vasculature is the cause of increased mean PAP in patients with PAH. While excessive proliferation of PA-SMCs and accumulation/activation of perivascular monocyte/macrophage are the main contributors of this process, the mechanisms that mediate these effects are incompletely understood . Herein, we are showing that dysfunctional P-ECs represent an abnormal local source of Ob, which, in turn, acts on different cell types via autocrine and paracrine effects: P-ECs, PA-SMCs and monocyte/macrophage lineage cells, respectively. Indeed, with human data obtained in situ and in vitro, as well as with in vivo experiments, we are demonstrating here that Ob/ObR-b axis is able to induce PA-SMC proliferation, perivascular monocyte/macrophage lineage cell accumulation and contribute to the P-EC pro-inflammatory phenotype, which represent major contributors of pulmonary vascular remodelling in PAH [36, 37]. Consistent with these findings, we show that chronic Ob injections worsen PH severity in mice. The absence of Ob effects on vascular remodelling may be linked to an altered pulmonary vascular reactivity due to endothelial dysfunction . Although the exact role played by both increased systemic and lung perivascular inflammation in PAH pathogenesis is still unclear, increasing evidence demonstrates that the degree of perivascular inflammation correlates with the disease severity, and in particular with pulmonary vascular wall remodelling and thickness [38, 39]. Using neonatal, chronic hypoxia-induced PH models, Frid et al. found that pulmonary adventitial remodelling was due to the robust recruitment of monocyte/macrophage lineage cells expressing α-SMA that can produce collagen. More recently, Vergadi et al. provided evidence that not only alveolar macrophages are associated with chronic hypoxia-induced PH development in vivo, but that hypoxic alveolar macrophages are also able to induce PA-SMC proliferation in vitro. Conversely, PA-SMCs are known to release a large variety of pro-inflammatory factors including cytokines, chemokines and growth factors in asthma  and in acute lung inflammation . Taken together, all these findings suggest that PA-SMC proliferation and perivascular monocyte/macrophage lineage cell accumulation may not represent two distinct components of the pulmonary vascular remodelling but rather two closely interdependent processes. Nevertheless, key questions remain unanswered concerning the initiating triggers of these phenomena. Herein, we demonstrate that targeting the over activation of Ob/ObR-b axis represents a potential innovative therapeutical approach in PAH, acting not only on the smooth muscle hyperplasia but also on the perivascular monocyte/macrophage lineage cell accumulation. Beside these findings, further studies are needed to better define the exact mechanisms by which monocyte/macrophage lineage cells can induce PA-SMC proliferation and whether PA-SMCs can contribute to perivascular monocyte/macrophage lineage cell recruitment, adhesion and infiltration. Numerous preclinical studies support the beneficial effects of DCA against experimental PH, including in the chronic hypoxia- and monocrotaline-induced PH [28, 43–46]. DCA is known to target the cellular glycolysis/glucose oxidation ratio and to shift cell metabolism from anaerobic glycolysis to oxidative phosphorylation, via pyruvate dehydrogenase kinase inhibition, leading to HIF-1α degradation . While HIF-1α has been discovered as the master regulator of hypoxia-dependent responses, increasing evidence are indicating that HIF-1α is also closely linked to inflammation [25, 47]. In particular, it has been shown that regulatory interactions exist between HIF-1α and one of the main pro-inflammatory transcription factors, nuclear factor-κB [48, 49]. Using conditional HIF-1α deficient mice, it has also been shown that HIF-1α plays an active role in the regulation of innate responses by inducing macrophage survival and/or differentiation [50, 51]. In our study, we demonstrate a clinically relevant beneficial effect of DCA treatment on experimental PH, by acting on both PA-SMC proliferation and perivascular monocyte/macrophage lineage cell accumulation. In addition to inhibit HIF stabilisation, DCA is also known to have a wide spectrum of effects including production of reactive oxygen species and changes in the apoptosis/proliferation ratio without apparent toxicity. Therefore, the beneficial effect of DCA is multifactorial. Nevertheless, Ob/ObR-b appears clearly at the interface between metabolism shift and pulmonary vascular remodelling in PAH. In conclusion, taken altogether, our findings demonstrate a new mechanism in PAH pathogenesis, namely the abnormal over activation of Ob/ObR-b axis in the pulmonary vascular wall, contributing to PH susceptibility and progression. In addition, we demonstrate that inhibition of Ob/ObR-b axis represents a relevant treatment strategy to reverse pulmonary vascular remodelling in PAH targeting PA-SMC proliferation and perivascular monocyte/macrophage lineage cell accumulation. The authors thank Yuichi Tamura (INSERM UMR_S 999, Centre Chirurgical Marie Lannelongue, LabEx LERMIT, Le Plessis-Robinson and Faculté de Médecine, Université Paris-Sud, Le Kremlin-Bicêtre, France), Roland Jovan (AP-HP, Service de Pneumologie, DHU Thorax Innovation, Hôpital Bicêtre, Le Kremlin-Bicêtre, France) and Jennifer Bordenave (INSERM UMR_S 999, Centre Chirurgical Marie Lannelongue, LabEx LERMIT, Le Plessis-Robinson and Faculté de Médecine, Université Paris-Sud, Le Kremlin-Bicêtre, France) for their help in the study. Blocking macrophage leukotriene b4 prevents endothelial injury and reverses pulmonary hypertension. Sci Transl Med 2013; 5: 200ra117. Early macrophage recruitment and alternative activation are critical for the later development of hypoxia-induced pulmonary hypertension. Circulation 2011; 123: 1986–1995.
. Human leptin stimulates proliferation and activation of human circulating monocytes. Cell Immunol 1999; 194: 6–11. Leptin induces mitochondrial superoxide production and monocyte chemoattractant protein-1 expression in aortic endothelial cells by increasing fatty acid oxidation via protein kinase A. J Biol Chem 2001; 276: 25096–25100. Leptin promotes vascular remodeling and neointimal growth in mice. Arterioscler Thromb Vasc Biol 2004; 24: 112–117. Leptin and regulatory T-lymphocytes in idiopathic pulmonary arterial hypertension. Eur Respir J 2012; 40: 895–904.
. Leptin and atherosclerosis. Atherosclerosis 2006; 189: 47–60. Pulmonary vasoreactivity in spontaneously hypertensive rats – effects of endothelin-1 and leptin. Respir Res 2014; 15: 12. Leptin levels predict survival in pulmonary arterial hypertension. Pulm Circ 2012; 2: 214–219. Leptin deficiency recapitulates the histological features of pulmonary arterial hypertension in mice. Int J Clin Exp Patho 2014; 7: 1935–1946. A critical role for p130Cas in the progression of pulmonary hypertension in humans and rodents. Am J Respir Crit Care Med 2012; 186: 666–676. Serotonin transporter inhibition prevents and reverses monocrotaline-induced pulmonary hypertension in rats. Circulation 2005; 111: 2812–2819. Leptin enhances the recruitment of endothelial progenitor cells into neointimal lesions after vascular injury by promoting integrin-mediated adhesion. Circ Res 2008; 103: 536–544. Modulating effect of leptin on basal and follicle stimulating hormone stimulated steroidogenesis in cultured human lutein granulosa cells. J Endocrinol Invest 2009; 32: 415–419. Leptin affects proliferation-, apoptosis- and protein kinase A-related peptides in human ovarian granulosa cells. Physiol Res 2008; 57: 437–442. Enhanced hypothalamic leptin signaling in mice lacking dopamine D2 receptors. J Biol Chem 2010; 285: 8905–8917. La Cava A, et al. Leptin neutralization interferes with pathogenic T cell autoreactivity in autoimmune encephalomyelitis. J Clin Investig 2006; 116: 447–455. Le Hiress M, et al. Increased pericyte coverage mediated by endothelial-derived fibroblast growth factor-2 and interleukin-6 is a source of smooth muscle-like cells in pulmonary hypertension. Circulation 2014; 129: 1586–1597. Autocrine fibroblast growth factor-2 signaling contributes to altered endothelial phenotype in pulmonary hypertension. Am J Respir Cell Mol Biol 2011; 45: 311–322. Dichloroacetate treatment partially regresses established pulmonary hypertension in mice with SM22α-targeted overexpression of the serotonin transporter. FASEB J 2009; 23: 4135–4147. Transcriptional activation of the human leptin gene in response to hypoxia. Involvement of hypoxia-inducible factor 1. J Biol Chem 2002; 277: 34601–34609. Leptin, from fat to inflammation: old questions and new insights. FEBS Lett 2005; 579: 295–301.
. Hypoxia-inducible factors in physiology and medicine. Cell 2012; 148: 399–408. Dichloroacetate, a metabolic modulator, prevents and reverses chronic hypoxic pulmonary hypertension in rats: role of increased expression and activity of voltage-gated potassium channels. Circulation 2002; 105: 244–250. Mitochondrial activation by inhibition of PDKII suppresses HIF1a signaling and angiogenesis in cancer. Oncogene 2013; 32: 1638–1650. 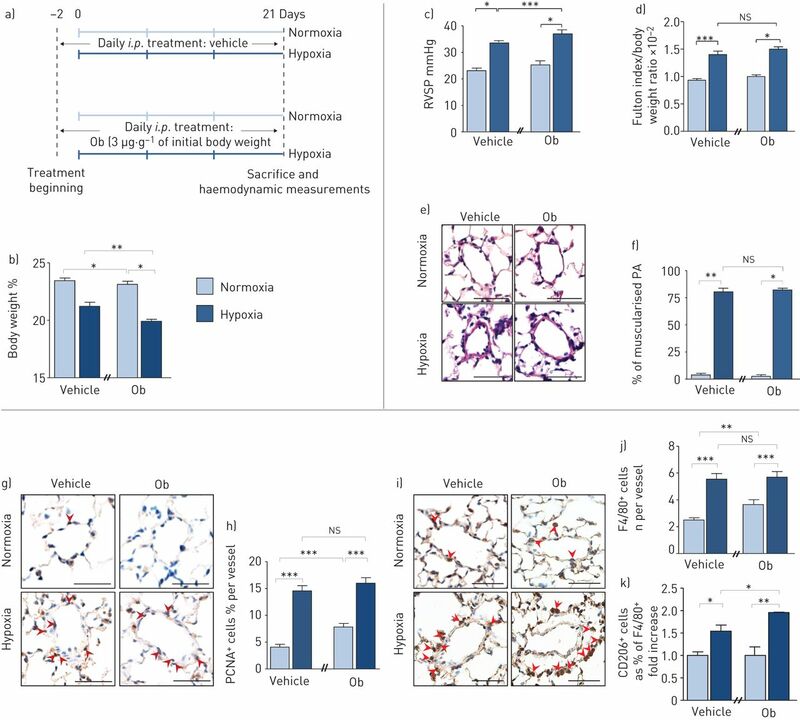 An abnormal mitochondrial-hypoxia inducible factor-1α-Kv channel pathway disrupts oxygen sensing and triggers pulmonary arterial hypertension in fawn hooded rats: similarities to human pulmonary arterial hypertension. Circulation 2006; 113: 2630–2641. Impaired physiological responses to chronic hypoxia in mice partially deficient for hypoxia-inducible factor 1alpha. J Clin Investig 1999; 103: 691–696. 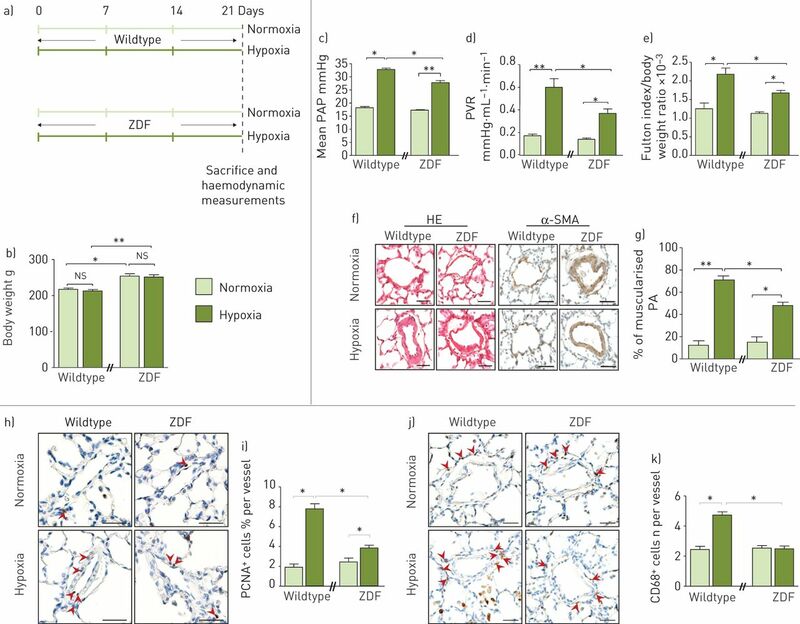 Heterozygous deficiency of hypoxia-inducible factor-2α protects mice against pulmonary hypertension and right ventricular dysfunction during prolonged hypoxia. J Clin Investig 2003; 111: 1519–1527.
. HIF and the lung: role of hypoxia-inducible factors in pulmonary development and disease. Am J Respir Crit Care Med 2011; 183: 152–156. Neointimal formation after endovascular arterial injury is markedly attenuated in db/db mice. Arterioscler Thromb Vasc Biol 2003; 23: 2027–2033. Leptin regulates neointima formation after arterial injury through mechanisms independent of blood pressure and the leptin receptor/STAT3 signaling pathways involved in energy balance. Arterioscler Thromb Vasc Biol 2007; 27: 70–76. Phenotypic abnormalities in macrophages from leptin-deficient, obese mice. Am J Physiol 1999; 276: C386–C394. Relevant issues in the pathology and pathobiology of pulmonary hypertension. J Am Coll Cardiol 2013; 62: Suppl. 25, D4–D12. Modern age pathology of pulmonary arterial hypertension. Am J Respir Crit Care Med 2012; 186: 261–272.
. Progress in pulmonary arterial hypertension pathology: relighting a torch inside the tunnel. Am J Respir Crit Care Med 2012; 186: 210–212. Hypoxia-induced pulmonary vascular remodeling requires recruitment of circulating mesenchymal precursors of a monocyte/macrophage lineage. Am J Pathol 2006; 168: 659–669.
. Noncontractile functions of airway smooth muscle cells in asthma. Annu Rev Physiol 2009; 71: 509–535. Smooth muscle cells relay acute pulmonary inflammation via distinct ADAM17/ErbB axes. J Immunol 2014; 192: 722–731. Mitochondrial metabolism, redox signaling, and fusion: a mitochondria-ROS-HIF-1α-Kv1.5 O2-sensing pathway at the intersection of pulmonary hypertension and cancer. Am J Physiol Heart Circ Physiol 2008; 294: H570–H578. Transgenic mice overexpressing the 5-hydroxytryptamine transporter gene in smooth muscle develop pulmonary hypertension. Circ Res 2006; 98: 1323–1330. Alterations in a redox oxygen sensing mechanism in chronic hypoxia. J Appl Physiol (1985) 2001; 90: 2249–2256. Dysfunctional voltage-gated K+ channels in pulmonary artery smooth muscle cells of patients with primary pulmonary hypertension. Circulation 1998; 98: 1400–1406.
. Targeting the HIF pathway in inflammation and immunity. Curr Opin Pharmacol 2013; 13: 646–653. Erythrocytes induce proinflammatory endothelial activation in hypoxia. Am J Respir Cell Mol Biol 2013; 48: 78–86. NF-κB links innate immunity to the hypoxic response through transcriptional regulation of HIF-1α. Nature 2008; 453: 807–811. Hypoxia-induced neutrophil survival is mediated by HIF-1α-dependent NF-κB activity. J Exp Med 2005; 201: 105–115.
. Macrophage responses to hypoxia: implications for tumor progression and anti-cancer therapies. Am J Pathol 2005; 167: 627–635.